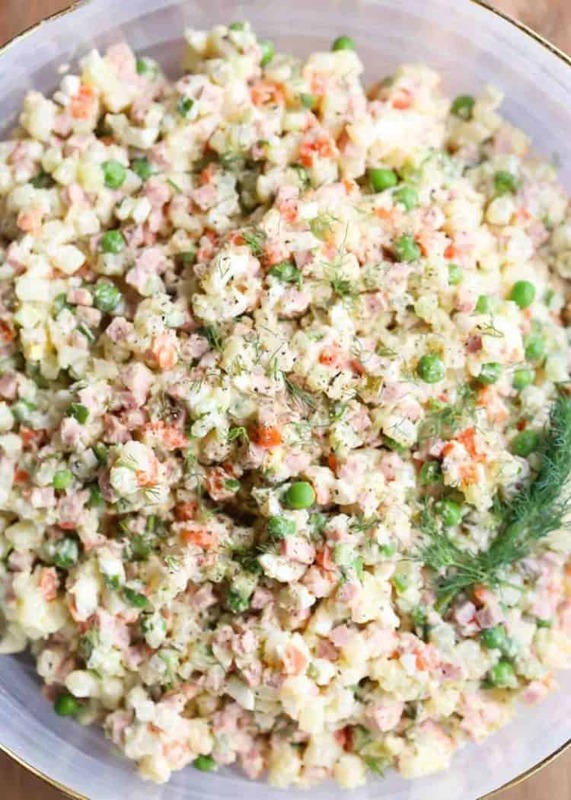 This Olivier Salad (Russian Potato Salad) recipe is such a unique recipe. It’s a traditional dish in the Russian cuisine and served in most restaurants and parties. This salad is commonly known as the Russian Salad, or Olivye in the Ukrainian community. Sharing the recipe for the traditional Russian Potato Salad also known as Olivier Salad (Olivye) and in our times referred to as Russian Salad. 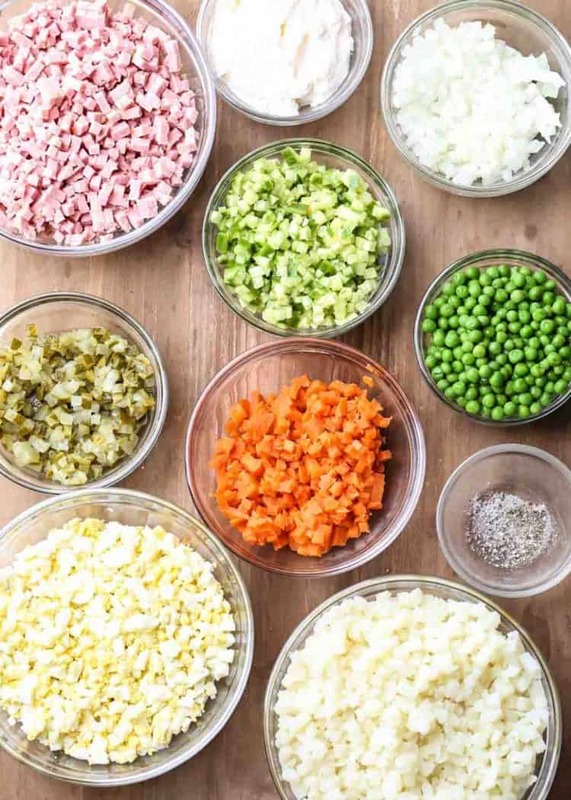 Olivier Salad usually has peas, potatoes, carrots, onions, meat, pickles, and eggs all mixed with mayo. The meat used is either bologna, chicken or ham. The potatoes, eggs and carrots are cooked by boiling with skin on in water, then peeled. PERFECT CUBES: Use this slicer to get the perfect sized even pieces, every time. You’re welcome. 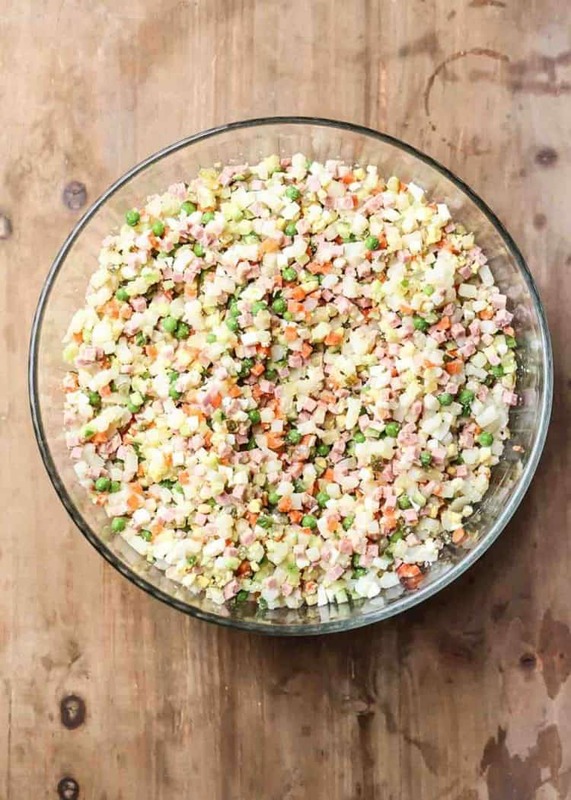 When to serve Olivier Salad (Olivye)? Olivier salad is popular around the traditional holidays of New Year’s, Christmas and Easter. It is also a salad served at most parties and family get-togethers in the Russian/Ukraine communities. Those of us that live in the United States and are slowly adjusting to more Americanized food, don’t serve this salad as often as our parents did. This salad will keep well for days in the refrigerator. You can either mix everything and add the mayo at once or just add mayo to the salad fresh when serving. Cook the potatoes and carrots together. Check readiness of the potatoes and carrots with a knife, it should piece through the center easily. Cooking them the night before is a great idea, once cooked just refrigerate (skin on). NOTE: The secret to the BEST olivye is allowing the cubed pickles to drain overnight in a sieve or squeezing out all the juices if in a hurry (just add the pickles to a few paper towels and squeeze). This way the juices from the pickles don’t overpower the flavors of the remaining ingredients and add sogginess to the salad. What meat can I use? You can use cooked chicken, ham or bologna for the recipe. If purchasing bologna in the deli department, ask for low-sodium bologna. It makes a huge difference. You can also ask them to cut the slices thicker so they are cubed evenly. I like to add new twists to traditional recipes. My biggest favorite addition I added to this salad is fresh cucumbers and using fresh peas instead of canned, (fresh frozen peas, thawed). The crunchiness of the fresh cucumbers gives it so much flavor. The canned peas are so soggy and taste mushy, using fresh peas take the salad to a new level. You’ll never want to go back to canned peas again. So we have this tradition with Olivier Salad (Olivye salat) my mom started. If we serve Olivye, we must serve stuffed cabbage rolls as well (recipe here). Which means, if we ever have Russian stuffed cabbage rolls, we always serve Olivye. It may sound silly to you, but it’s a tradition in our family and we are faithful, lol. Stuffed Cabbage Rolls– A must try. Russian Bread– So easy to make with wonderful results. 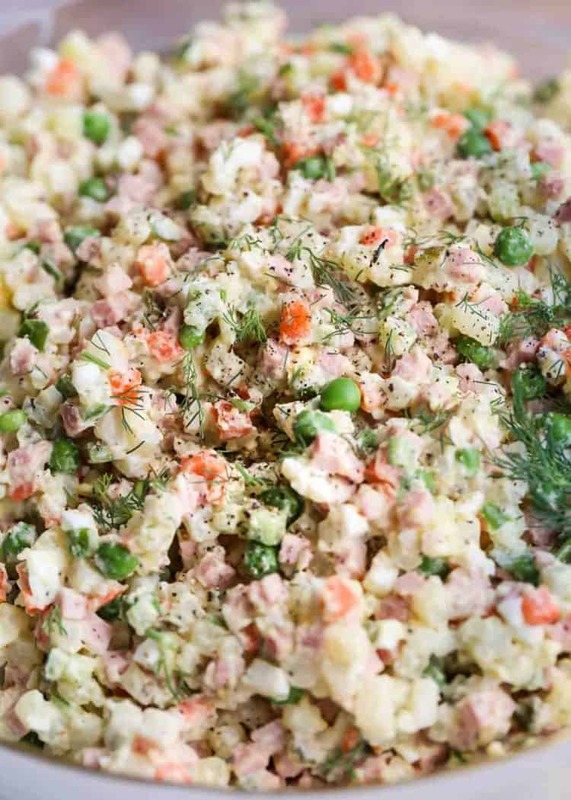 This Olivier Salad (Russian Potato Salad) recipe is a great recipe. It’s a traditional dish in the Russian cuisine and served in most restaurants and parties. 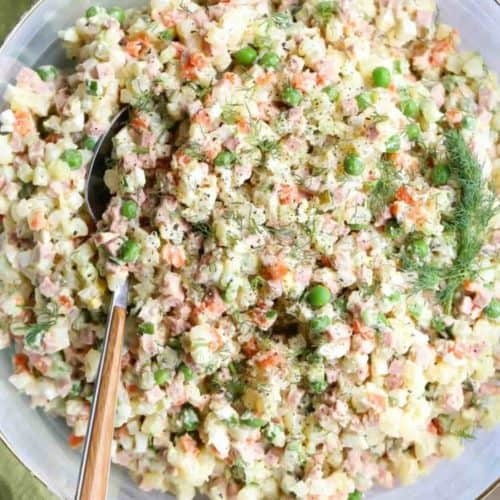 This salad is commonly known as the Russian salad and Olivye in the Ukrainian community. In a small pot add eggs, cover eggs will water and bring to a boil cook. Cook eggs 8-10 minutes. Cube all of the ingredients. Combine everything, mix. Add mayo to taste. You may need a little more than 1 cup, depending on sizes of your ingredients. Season with salt, pepper and sugar. Add fresh dill, mix. Haven’t tried making olivye with frozen peas yet. Will try it next time. No wonder every time I made this salad it was so soggy. We just always chop and add every together. I let it drain a bit and you are right. There was so much that came out. Definitely always going to do this. Also, we never did fresh peas or onion either. Makes a huge difference So glad I tried your way. My family loved it. Thank you for all the tips.